I have had a few people tell me that they want the "Label It" center from my monthly CCS center packs in EVERY month...they really like them! So, I've decided to make MONTHLY Label It Packs! These will be separate from what is included in my monthly CCS center packs. I actually REALLY like these because they are great vocabulary words for writing. It gives their brain a place to start...some ideas. My plan was just to make one big pack with all the months in it. But then, when I got started, I realized that just one month was almost 100 pages! The ideas for pictures just kept coming....and I had to make myself stop, or I could have gone even further! So, here's what I came up with for August. Now, I know that some of you don't go back to school in August, or if you do, it might be the end of August, but you could still use this for Back To School themes. I guess that would have been a better title "Back to School" but then that would have messed up with with my need for everything to be uniform...haha! 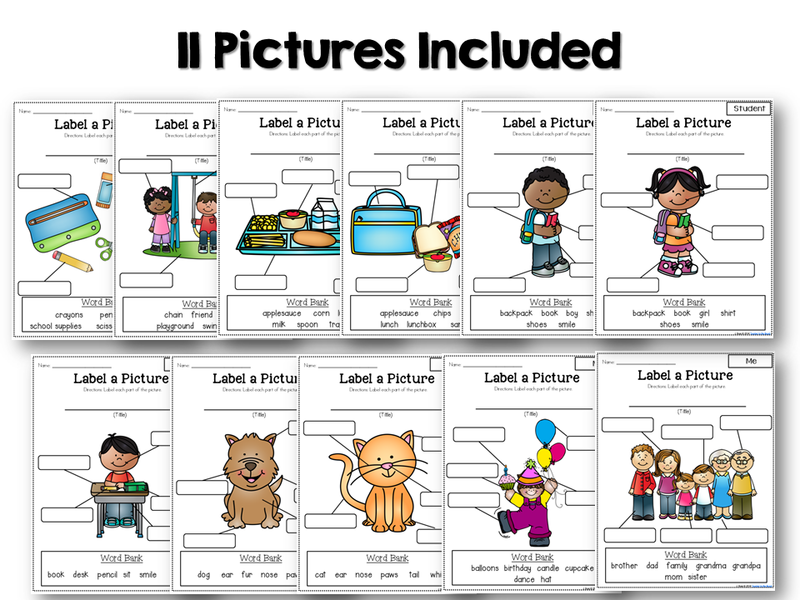 There are 4 versions of each picture... A color one (mainly for teacher purposes), one that is JUST labeling, then 2 versions of the "caption" picture (regular lines and writing lines). There are also 4 versions of each writing page. This layout will be the same for ALL of the months. 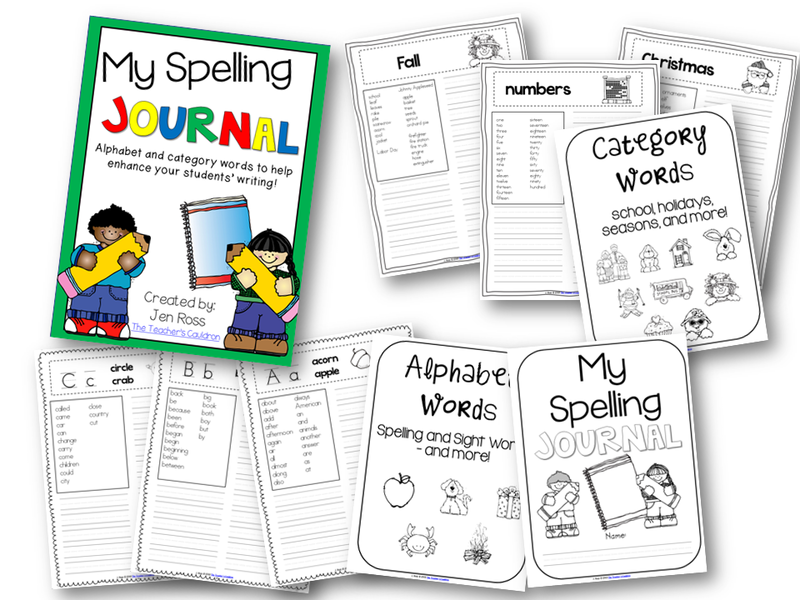 I have included word banks on each page so that it's easier for the students to know how to spell THOSE words. 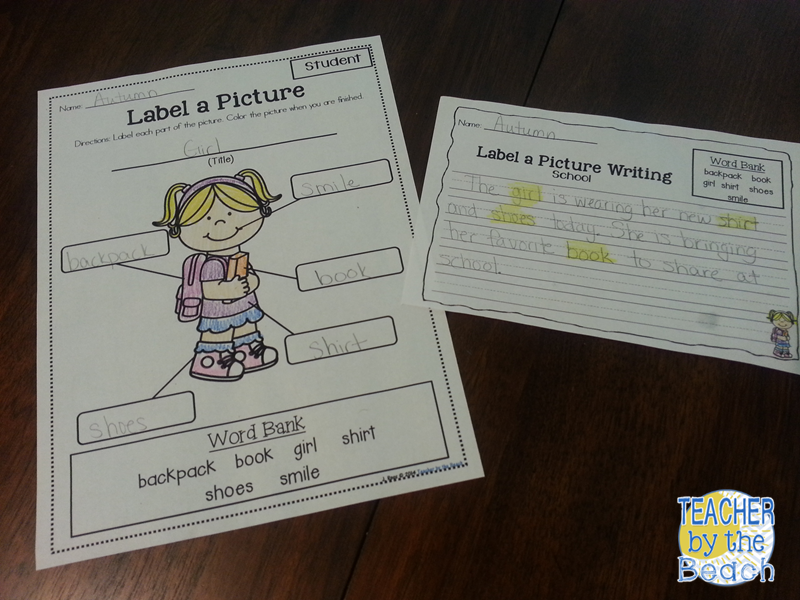 Even the writing pages have the word banks, which I love because that way, you could use JUST the writing pages for a writing activity and NOT the pictures pages. There are so many different ways you could use these activities! Here are some examples of how you could have them do them in your class. 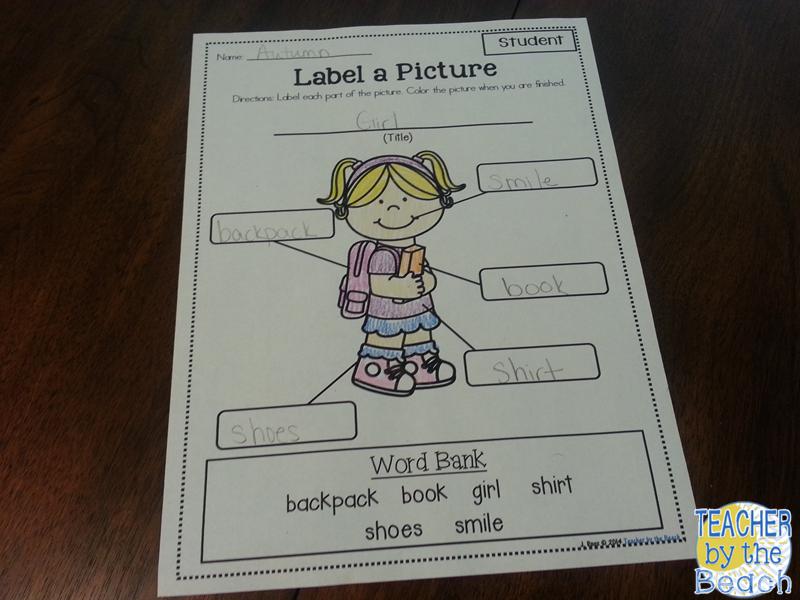 This one is labeling, coloring and then adding a written aspect to it. This would obviously be for your more experienced writers. I like to have the kids "highlight" the words from the pictures in their writing with a light colored crayon (yellow, light green, light orange, or pink). For even MORE writing, there is a FULL PAGE that you could use! Another option you could do is a lesser version of the written version. This one I like to do. I have the students label the picture and color it... but THEN they have to add in a scene. This is a scene of the girl walking to school. This gets them to think about settings and such. Then, under the picture, they have to write a "caption" for the picture. Again, I like for them to highlight the words they use. Now some of the words they want to use won't be in the word bank. But that's when I tell them to get out their Spelling Journals. I have a "Category" section and just about about every theme you can think of is in there...and if it's not? Then we write it in! They have their own personal word walls whenever they need them! You can check out my post on them HERE. AND, since I haven't blogged about them since I posted them back in June, I've even had time to finish September's pack! Want to try it out for free??? 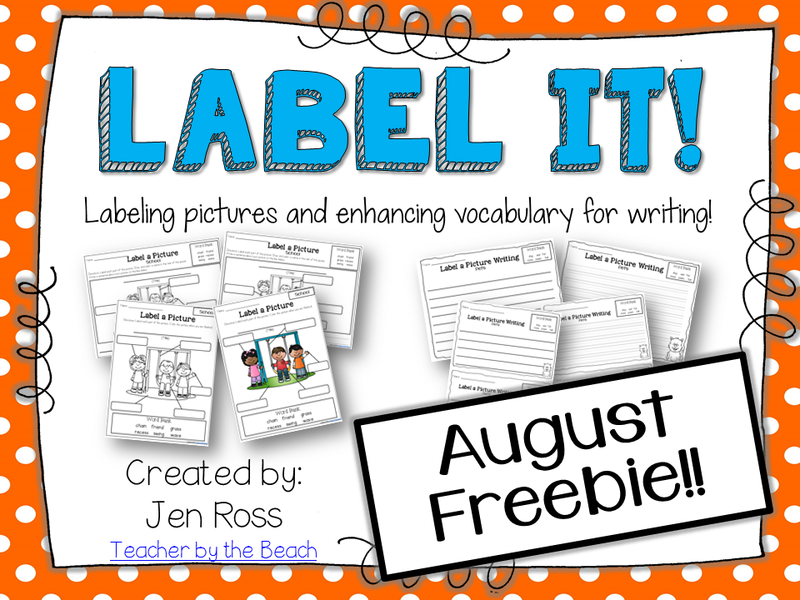 You can download the freebie version from my August pack! Oooohhhh! I love these! Perfect literacy centers for beginning first grade! Your plan actually works and every type of the kids will understand this lesson. 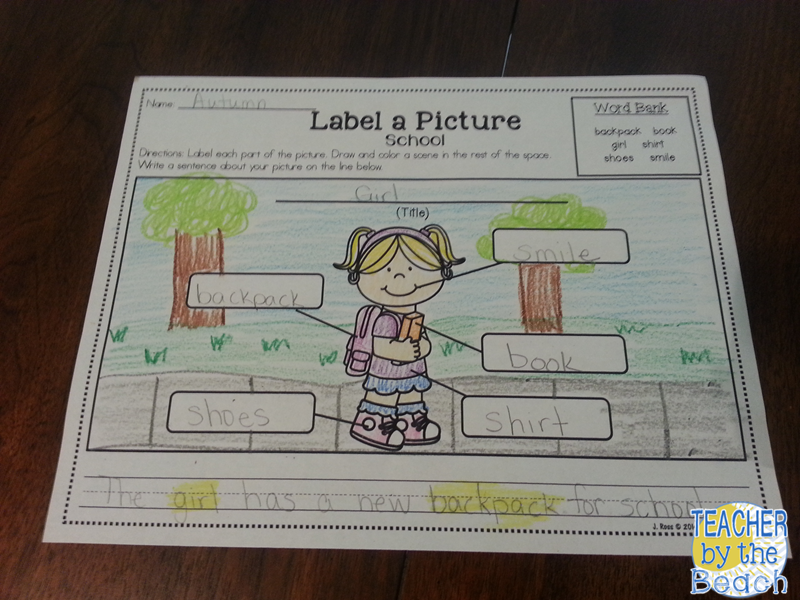 With the help of the picture, they will learn lots of the things and carry the good information. You are showing your experience in this field but best essay writing provides authentic info to manage all type of task. The free site for the roblox free robux game to play free then use http://rbxgenerator.com for the free robux generation for the free using the free robux generator for the roblox robux game to play free.